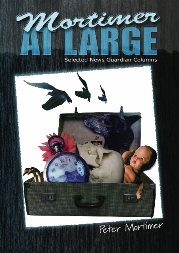 Mortimer at Large contains a selection of around 140 columns which have appeared weekly in the News Guardian since 2003. Whether Peter Mortimer is finding weapons of mass destruction in a Cullercoats litter bin, planning an underwater theatre festival, proposing to cover St Mary's Lighthouse in graffiti, exposing a clandestine seafront meeting between The Queen and the US President, or arranging ten thousand people to shout a poem along the entire coastline, the writing offers a unique offbeat humour, satire and occasional surrealism. Though mainly domiciled in his study with a Rington's ginger biscuit, Peter Mortimer has also winged the columns back from the mountains of Yemen, a medieval Italian village, Minneapolis on the day of the bridge disaster, the Isle of Man, and the sunnier side of Rotherham.